Click the button below to add the 2 Way Hardside Waterbed Padded Rails to your wish list. Waterbed rails are available in a variety of colors to match or complement any decor. 2-way padded rails cover the (longer) side rails of your hardside waterbed and protect you as you get into and out of bed. Only Standard Padding is available in stock and ships in 5-10 days, all thicker options are special order and require 4-6 weeks to deliver. Supreme Extra Tall Padding with upholstered decorative buttons– Available with extra tall padding along the outside edge to protect more of the side rail. Jumbo Krinkle– Extra thick padding combined with a generous over-upholstering to provide the ultimate in luxury and comfort whenever you encounter the edge of your hardside waterbed. 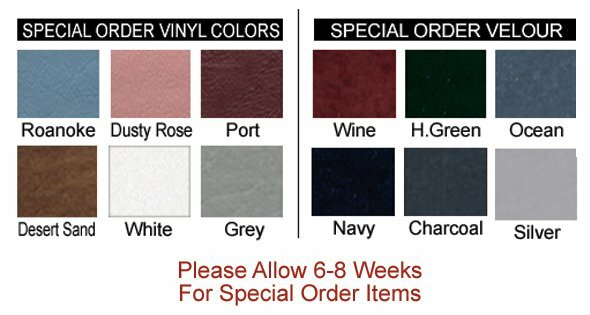 Please review and note which colors and upholstery options are designated Special Order as these orders will require 4-6 weeks to deliver.